It wasn't even close to an easy game, but the Merengues pulled off an impressive 1-6 win in Turkey and brought the 3 points back to the Spanish capital. Real Madrid crushed Galatasaray at the Turkish Telekom Arena and Cristiano Ronaldo started off this Champions League edition with a superb hat-trick. Isco and Benzema (twice), scored the remaining goals for the Spanish vice-champions. The Turkish Telekom Arena is usually know for being a true hell for whoever steps in to face the home side, but this Tuesday night, the only true devils in the stadium were actually on Real Madrid side. The Merengues ran through their opponents in a 1-6 win and Galatasaray quite simply failed to find an effective response against the Spanish attacking "armada", led by a lethal Cristiano Ronaldo and supported on the inspired Benzema and Isco. The Portuguese superstar made his debut in this year's Champions League by scoring a fantastic hat-trick, making sure everyone got to know that he has serious plans about becoming the competition's top goalscorer for the second straight season. Carlo Ancelotti couldn't have asked for a better start in the Champions League, since his side not only came out of the Turkish Telekom Arena with the 3 points, but they've done it in an emphatic way. Gareth Bale started on the bench as Angel Di María took his place in the starting eleven, but it was on the back that the biggest gamble was done since as promised a few days ago, the Italian manager picked Iker Casillas over Diego López. The first half of last night's game was a bit troubled for both sides to say the least and if there's anyone with full rights to think he was extremely unlucky, that person has to be Iker Casillas. 238 days later, the Spanish goalkeeper had finally returned to Real Madrid's line-up in an official game, but he didn't last more than 15 minutes on the pitch. On the 23rd of January 2013, Casillas had suffered an injury from an involuntary kick by Arbeloa and this time it was Sergio Ramos who accidently bumped into him. The injury shouldn't be serious enough to make him unavailable for more than a few days, but he couldn't perform at his best if he had continued on the pitch and therefore he was forced to give his place to Diego López. In Galatasaray's side, it was Didier Drogba who picked up a shoulder injury after a clash with Pepe in the air and the former Chelsea forward had also to be replaced near the half-time. After a better start from Galatasaray, Real Madrid managed to react close to the first half an hour, thanks to the brilliance of their new rising star Isco. Angel Di María found the Spaniard making a run upfront with a long pass and the former Malaga midfielder showedcased his immense talent with a superb first touch that allowed him to get rid of two defenders at the same time he created a goalscoring chance for himself. He would then finish it off with a right-foot strike that still hit one of the posts before going in and Real Madrid had just picked an always precious lead. The second goal arrived in the beginning of the second half and it all started with a defensive clearance from Galatasaray. Pepe jumped alone and headed the ball back to their opponent's side and saw Felipe Melo mistiming his jump as he only managed to head the ball to his side. Unfortunately for the Brazilian, the ball felt to Di María, who reacted quickly with a first-touch pass to Benzema. The Frenchman had all the way clear in front of him and beat Muslera easily, in a 1-on-1 situation. The 0-3 was a bit comical but obviously counted as any other goal. Real Madrid was finding more and more gaps in Galatasaray's defense and after Di María collected a pass already inside the penalty area, the Argentinian rounded the goalkeeper and sent in a cross to the far post after getting himself without a favorable angle to shoot. Isco showed up right there, but also found himself in a difficult spot to hit the target, and so he decided to head it back for someone to push it in. That someone was Cristiano Ronaldo, who had just moved to the right place seconds before. 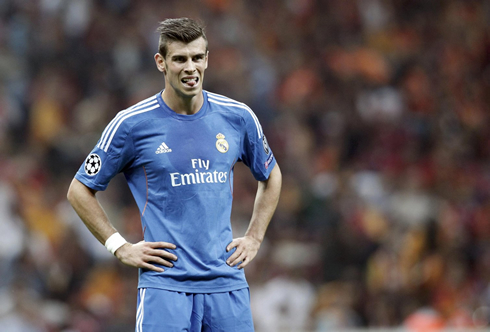 Just a few instants after Gareth Bale had made his entrance, Real Madrid reached their fourth goal of the night. The Welshman took a free kick on the right, curled the ball perfectly into a dangerous zone inside Galatasaray's penalty area and Sergio Ramos got to deflect it even though he could only head it with little conviction. Fernando Muslera managed to put his hands on the ball but not only to clear it away a couple of meters. Once again, Cristiano Ronaldo was on the right place and had no trouble in striking it to the back of the net, making it 0-4 to Real Madrid. With 80 minutes on the clock, the Merengues ended up reaching their hand-full of goals. Gareth Bale picked a ball deep inside Galatasaray's half, sent it over to an unmarked Cristiano Ronaldo and the Portuguese didn't lose time in exploring the space he had in front. After moving forward a few meters, CR7 delivered a ball to the middle with the outside part of his boot and assisted Karim Benzema for an easy tap-in, against an empty goal. Everything had just turned too easy and at that time, the home side were just wishing to hear the final whistle as soon as possible. However, the Turkish fans who had not decided to walk away on their team after seeing their side conceding 5 goals at home, ended up being rewarded with a consolation goal. Amrabat sent in a perfect cross on the right towards Real Madrid penalty area, and Umut Bulut managed to be faster than Pepe as he anticipated the Portuguese defender just before stricking the ball to the far post. Diego López only had the chance the follow it with his eyes and Galatasaray had finally earned a small motive to lift their heads. As the game dragged on to its own end without anything else noteworthy happening, it was on the first minute of added time that Cristiano Ronaldo decided to score the goal of the night and probably one of the best of his career. The Real Madrid superstar slalomed his way though two defenders, found some space to hit the target with his left foot and struck it past an helpless Fernando Muslera. Hat-trick for Cristiano Ronaldo and certainly the perfect start in the quest of "La Décima", for both the Portuguese player and Real Madrid. Cristiano Ronaldo next game for Real Madrid will be in the Spanish League, this Sunday (September 22, 2013), against Getafe at home, at the Santiago Bernabéu. In the meanwhile, you can watch Real Madrid vs Getafe, Barcelona vs Ajax, Chelsea vs Basel and Marseille vs Arsenal, all matches provided from our soccer live streaming section.